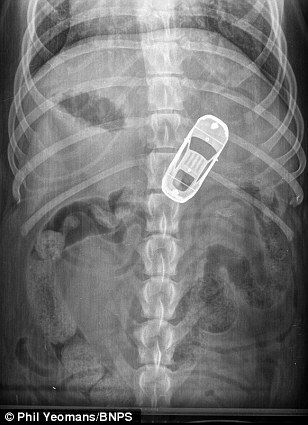 This x-ray reveals in stunning detail how a dinky, toy car, got stuck inside the stomach of a hungry pet dog. Indie the black labrador had to be rushed to the vet after wolfing down the three-inch metal Jaguar car. The two-year-old mutt, from Stoke Gifford, near Bristol, needed surgery to remove the car, which got stuck inside his digestive system.